Temperatures are cooling off and sundown is creeping up faster -- which means daylight savings time is around the corner. This year, we "fall back" on Sunday November 4, 2012 at 2:00am in the United States. With that in mind, we've rounded up 7 of our favorite eco-friendly time keepers for kids' rooms that you can get in time to turn back the hands of the clock. 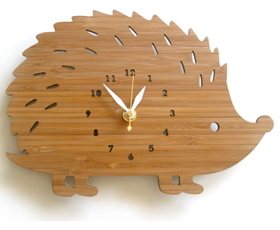 Decoy Lab's bamboo animal clocks keep track of time in green style, and they are available in an array of creatures from rabbits and hippos to fawns and hedgehogs (seen above). If your little one is an avid reader and lover of the written word, she'll dig these vintage book clocks which double as art and savvy decor. The eyes have it in these sustainably made wooden animal clocks that feature cutout number eyes as a cute touch. This super personable crab clock is cobbled together by hand from reclaimed household odds and ends. This tree owl wooden clock would look sweet in woodland themed nurseries, and parents will appreciate that the clock's Quartz movement ensures that no ticking will interfere with baby's sleep. This awesome bamboo soil clock is powered by dirt! It would make an ideal time keeper for any child who's interested in science and alternative sources of energy. Aspiring meteorologists will love this WoodStation clock which helps kids tune in to their environment by displaying the weather forecast for the next 24 hours.